California Has Just One Year of Water Reserves, So... Water Cannons? And it gets worse. Apparently we have no real plan for dealing with the continuation of our current drought. So what's Famiglietti's solution to this problem? Immediate mandatory water rationing, the acceleration of legislation that focuses on sustainability, and the creation of a new state task force to come up with long term solutions. Pffffft. Good luck. That all sounds hard. Like really hard. Even in a state that didn't have completely dysfunctional government, that would be hard. So may I suggest an idea from history? 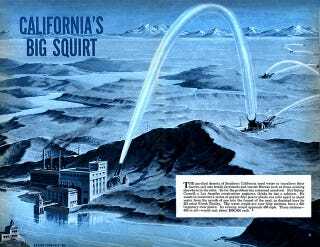 In the early 1950s a construction engineer by the name of Sidney Cornell proposed shooting man-made geysers from Northern California to Southern California. The illustration above ran in the October 1951 issue of Mechanix Illustrated magazine, showing how this whole thing was supposed to work. The system would leapfrog water down the state, with plants spaced one mile apart. Of course, with Northern California also struggling, we'll have to pull that water from somewhere else. Alaska, maybe? Yes, it's a really idiotic idea. But it seems about as likely as getting anything done politically at any level in California's government right now. Forget the Hyperloop. Bring on the water cannons!